In my previous blog post, I was telling you about how cold this Winter has been this year in most of the USA. Well, looks like we're now having a break from the freezing weather and we're now having temperatures near the 70's. With this "heatwave", I can't help but think about my shoe wardrobe for Spring. Last year I had the chance to acquire 2 or 3 pairs of beautiful and well-made sandals (See here, here and here). I've been looking for the newer styles as well. 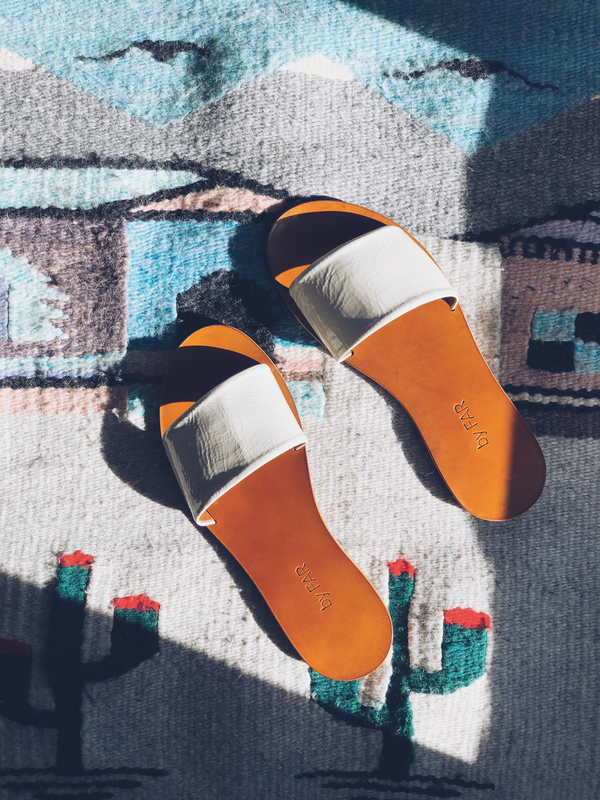 Right now, I'm very fond of the minimalist slide style, simply because it's easy to put on and also to style with our Spring and Summer wardrobes. So far, I have a new pair waiting to be worn this Spring (the ones in the picture above). I've found similar styles that I'll show you and totally recommend if you want to try something more simple or add a new color to your beautifully curated shoe wardrobe. In my opinion, the most universally flattering sandals are the ones with wide straps. They can easily accommodate to most foot shapes, therefore, more comfortable than styles with narrow straps.